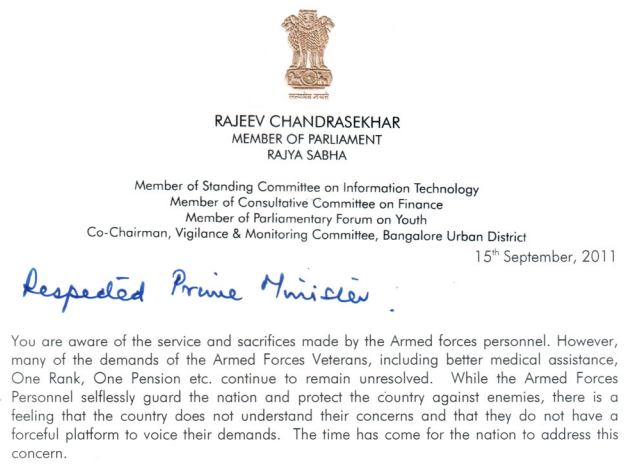 "Soldiers of the Indian Armed Forces who serve and those who have served, are the epitome of Service to the Nation, it is our duty to honour their service and sacrifices." 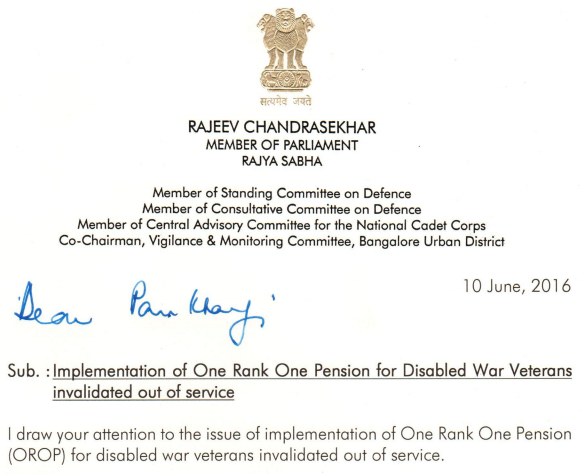 #OROP is the biggest and most significant welfare measure for veterans in Post-Independent India by any Government. 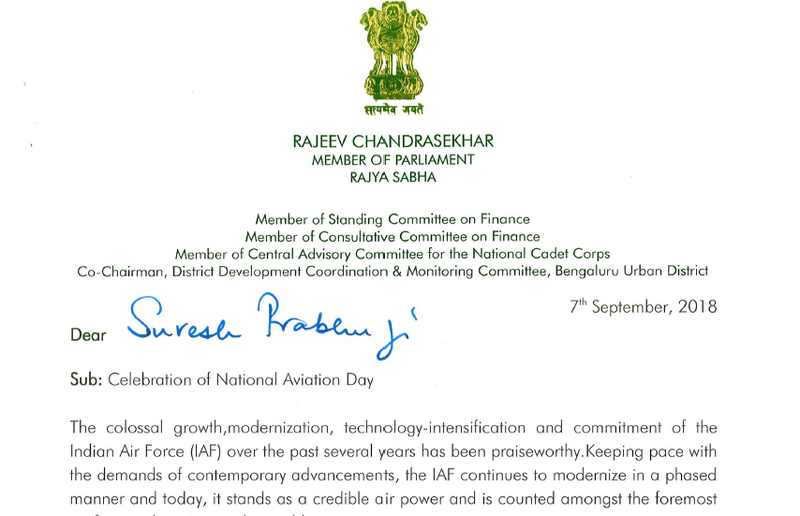 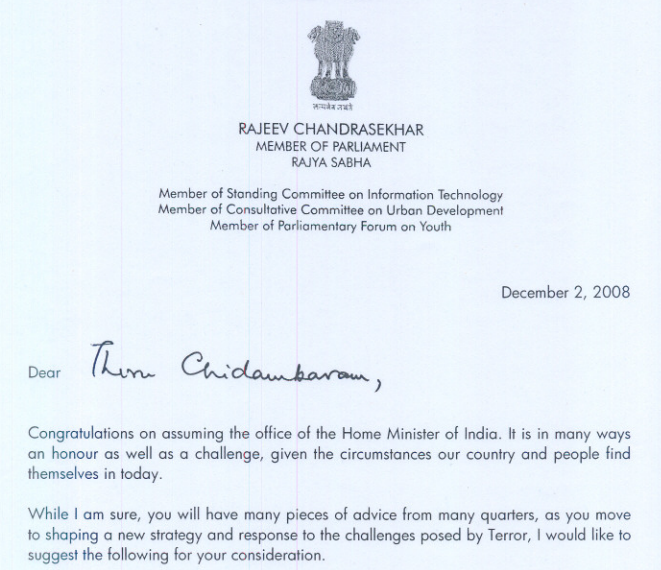 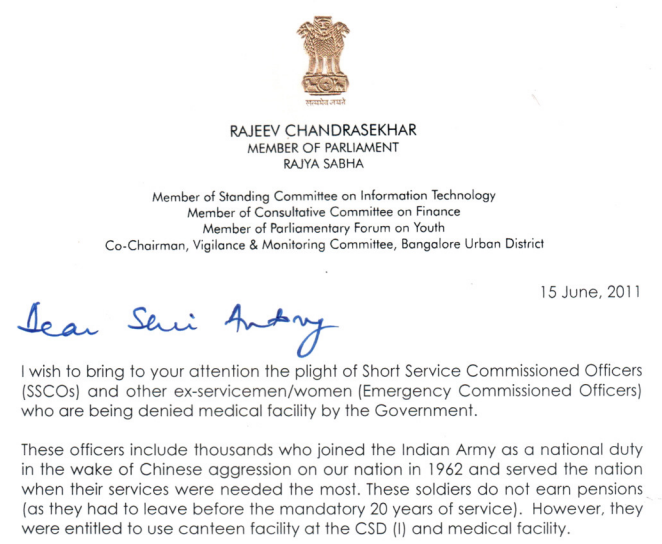 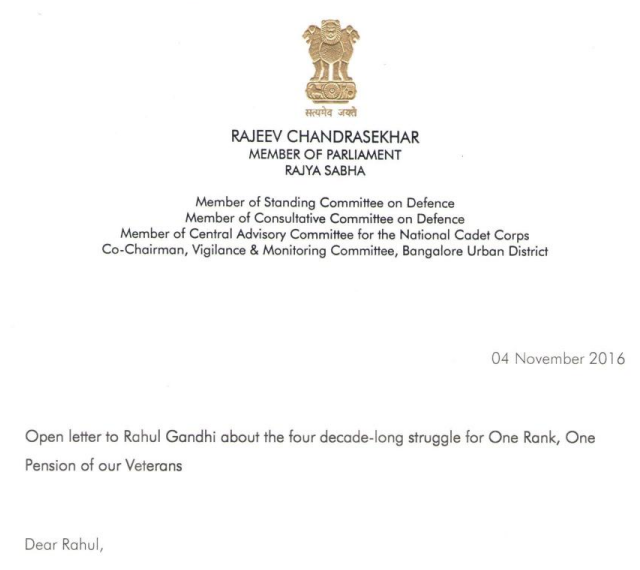 Rajeev Chandrasekhar is a strong supporter of the Armed Forces in India. 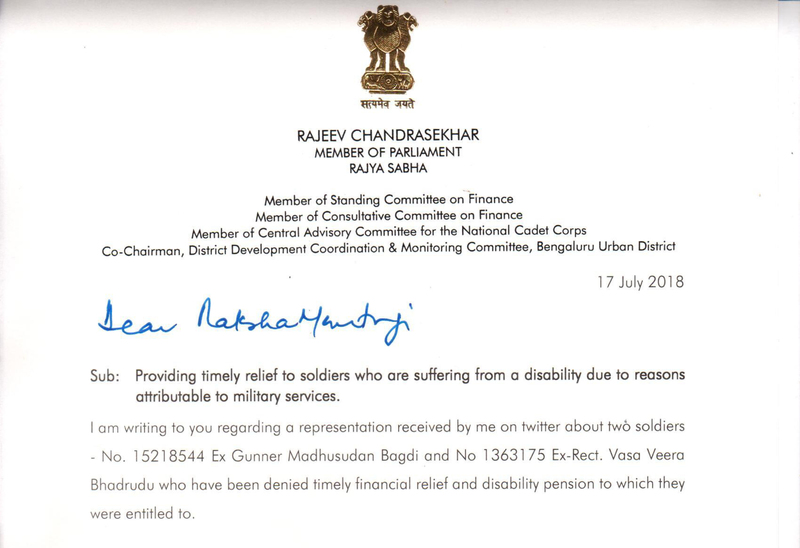 He has been the voice for the men and women in uniform who serve and the veterans who have served in the Armed Forces since he stepped into Parliament in 2006. 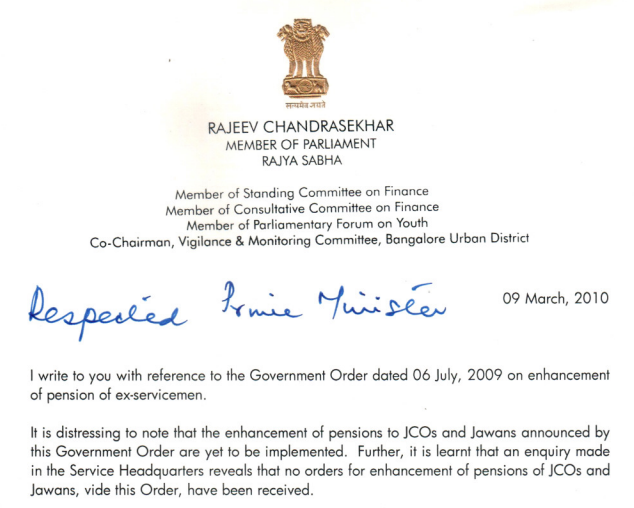 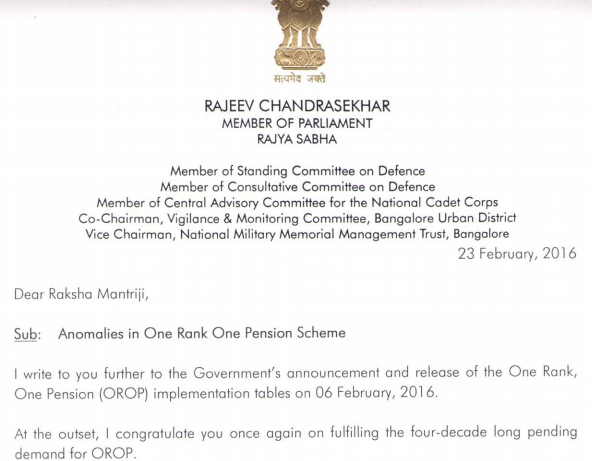 Rajeev is the lone Parliamentarian to have raised the issue of One Rank One Pension (OROP) persistently since 2008. 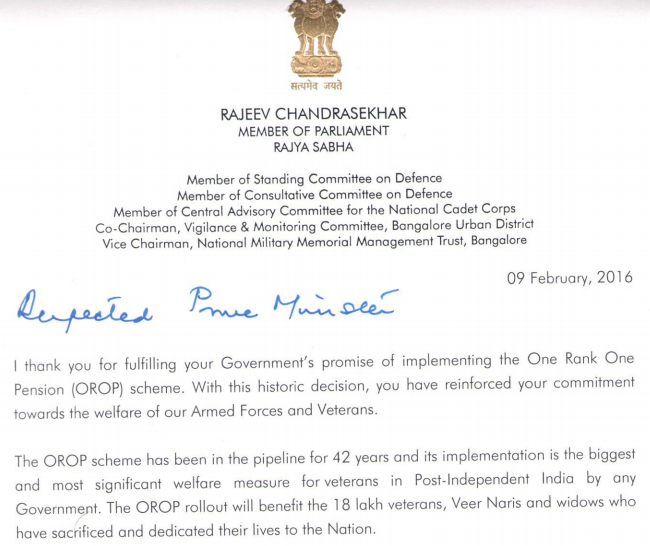 His long standing endeavour saw victory on 05 September 2015, when the Defence Minister Manohar Parrikar announced that the Government had accepted OROP and would implement it. 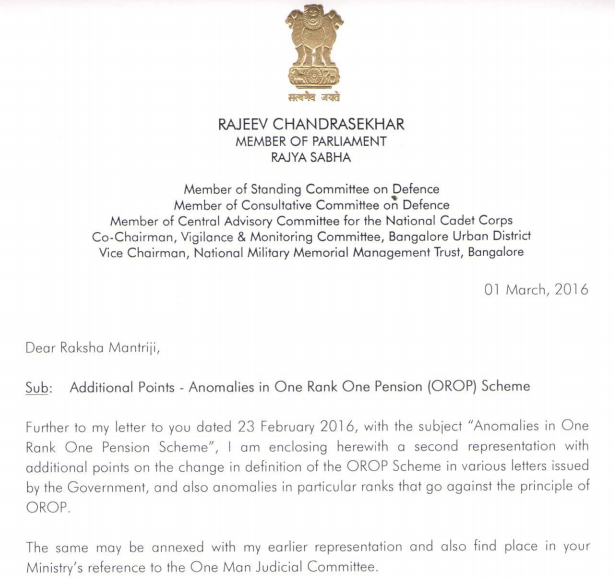 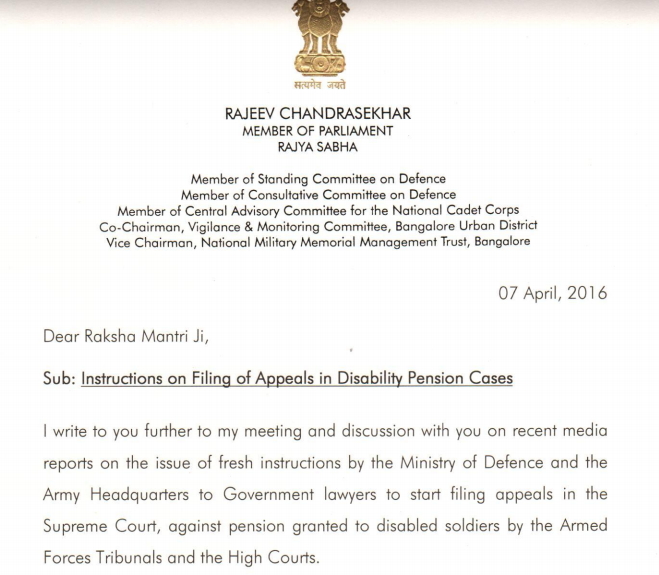 In November 2015, the Government went on to issue orders of implementation of OROP with effect from 01 July 2014. 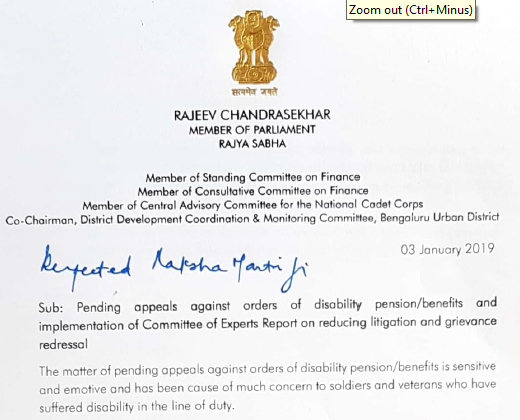 Rajeev welcomed the announcement stating it was the biggest and most significant welfare measure for veterans in Post-Independent India by any Government. 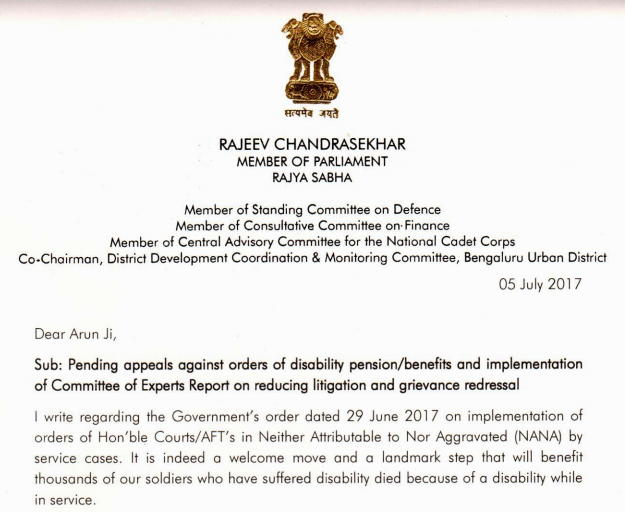 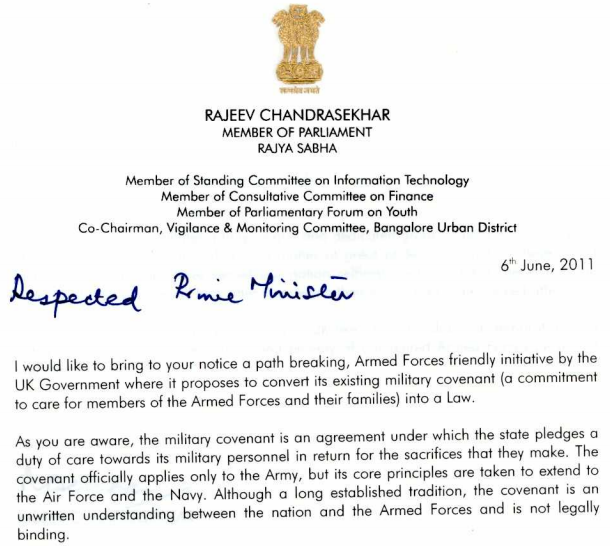 Rajeev spearheaded the introduction of the Armed Forces Covenant Bill that envisages “pledging of commitment” that soldiers— both retired and serving — and their families will be provided with medical support, education; good quality and affordable accommodation; a comprehensive compensation system; maintenance for disabled soldiers and bereaved families; reservation in civilian jobs particularly related to security and more. 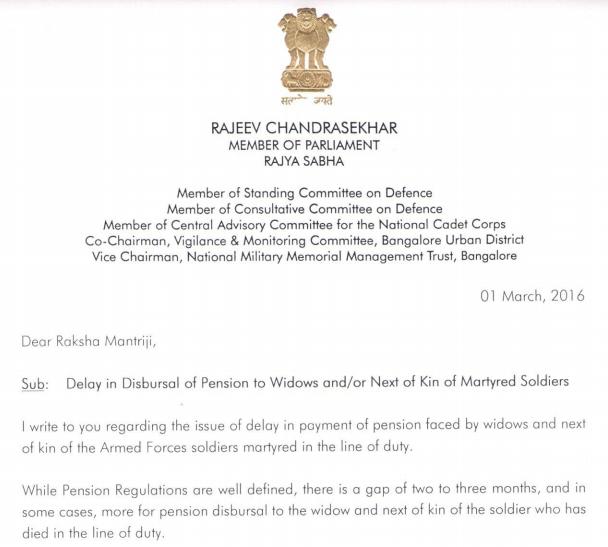 It also entails that the Government set up an Armed Forces Grievances Redressal Commission, comprising senior judges and top army brass to oversee that the provisions of the law are fulfilled. 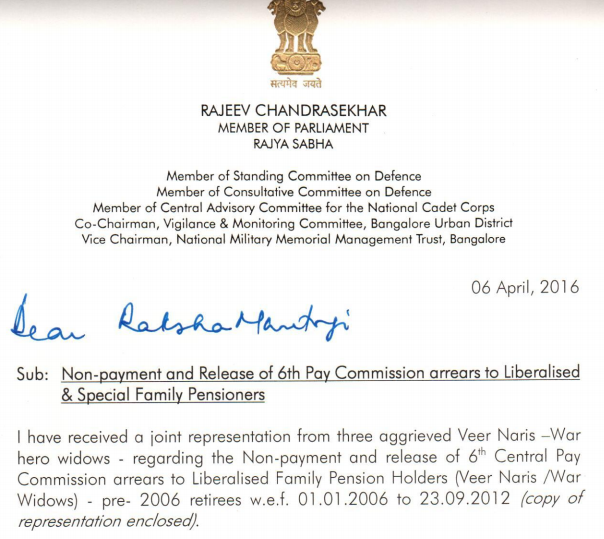 He has also demanded setting up of a Veterans Commission and nominations of a Veteran into Parliament. 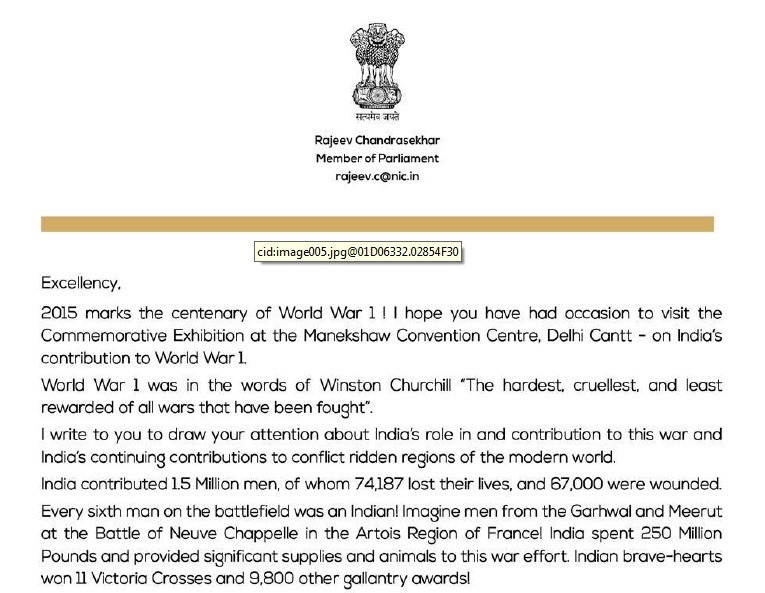 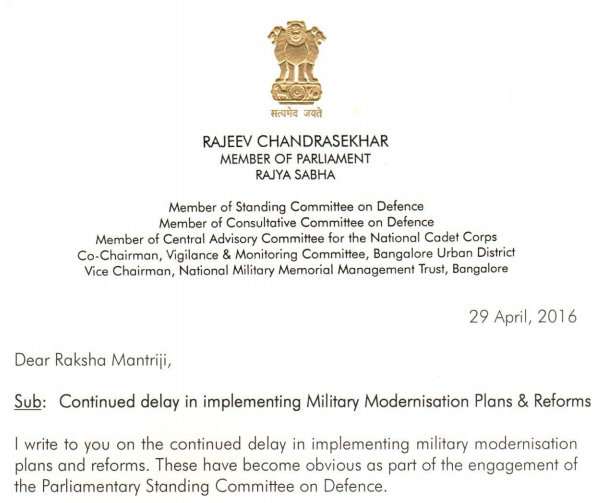 Rajeev has also raised the demand for a National Military Memorial in New Delhi, consistently in Parliament. 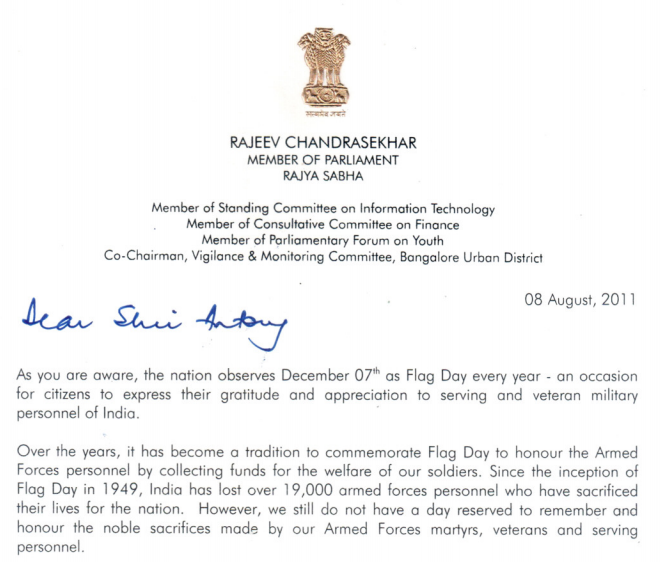 He believes that the Country needs to show deep gratitude to those who in times of war and peace have faithfully defended the Nation. . 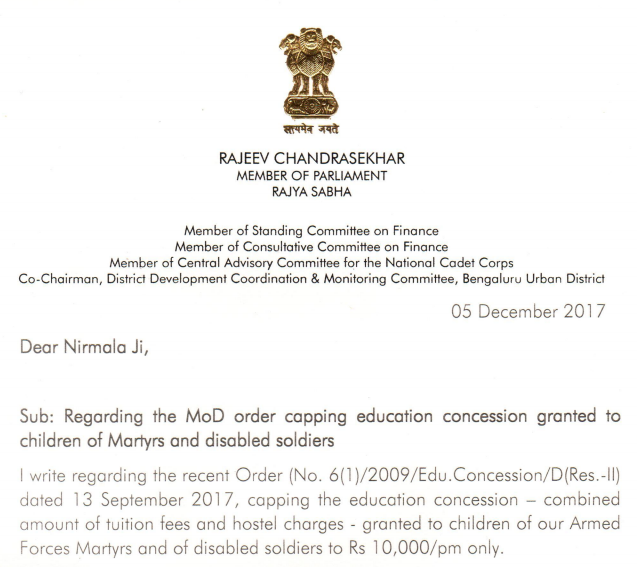 It was on his initiative, persistent efforts and a long legal battle resulted in building of the National Military Memorial at Bengaluru in 2012. 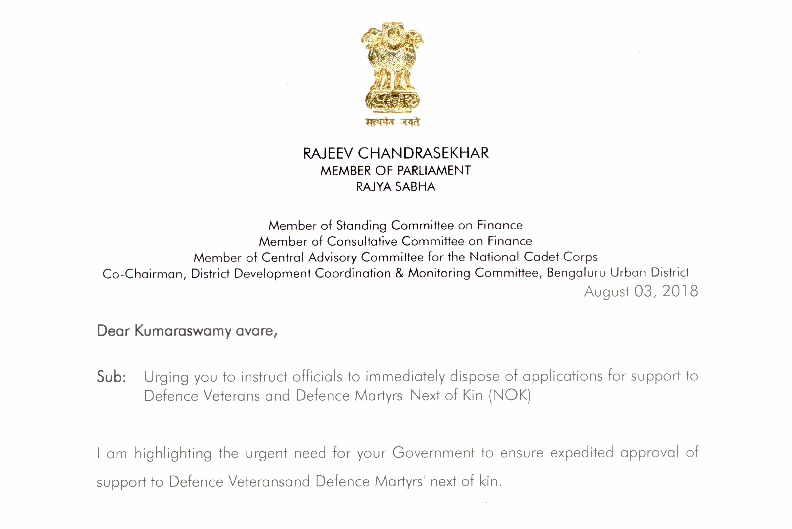 Rajeev has championed the rights of Armed Forces to exercise their franchise. 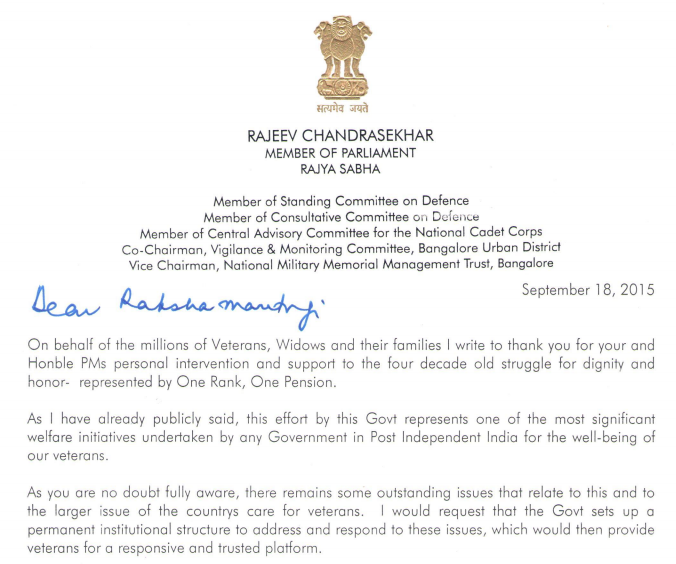 Taking the cause up on various platforms, Rajeev took the fight up to the Supreme Court of India. 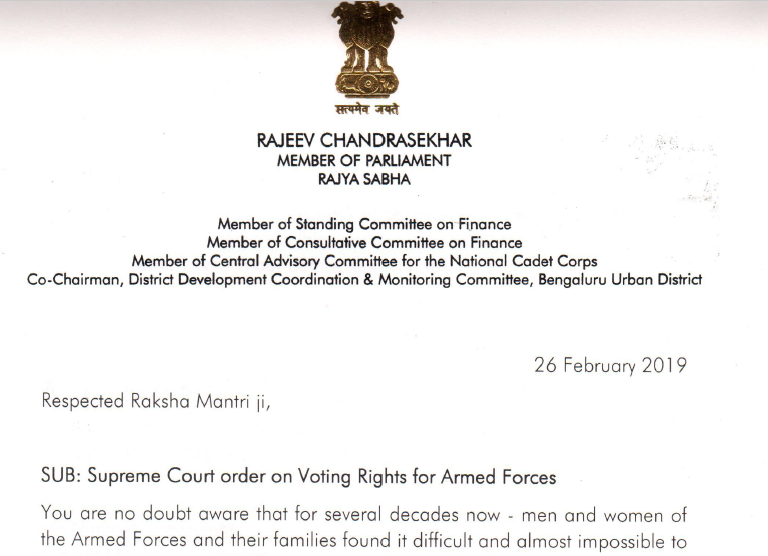 In March 2014, his fight saw a victory when the Court ordered the Election Commission to facilitate voting rights for armed forces and not obstruct it. 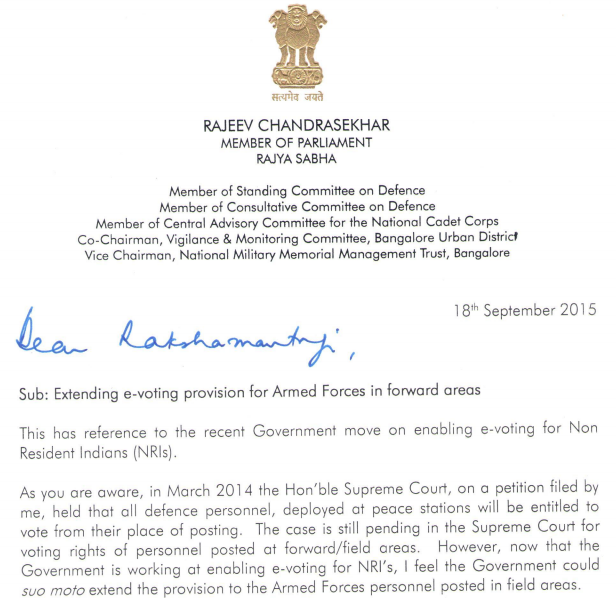 Armed forces personnel and their families stationed in peace areas since 1 January 2014 were considered general voters and allowed to vote at their place of posting. 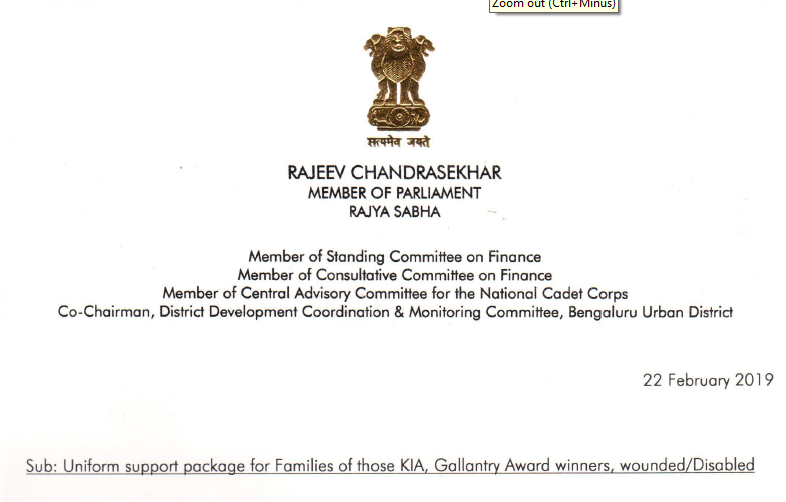 Rajeev, his foundation - the Flags of Honour, and Captain Kalia’s father Dr. N.K. 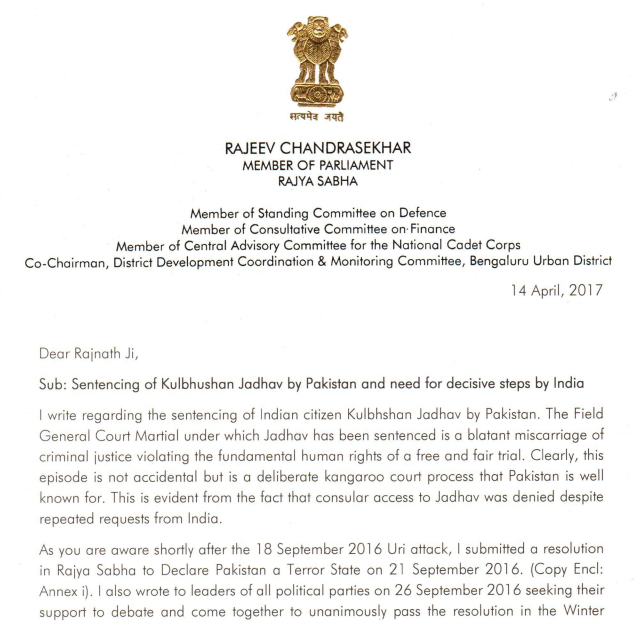 Kalia, filed a petition in UN Human Rights Council seeking independent investigations on the torture and death of Capt. 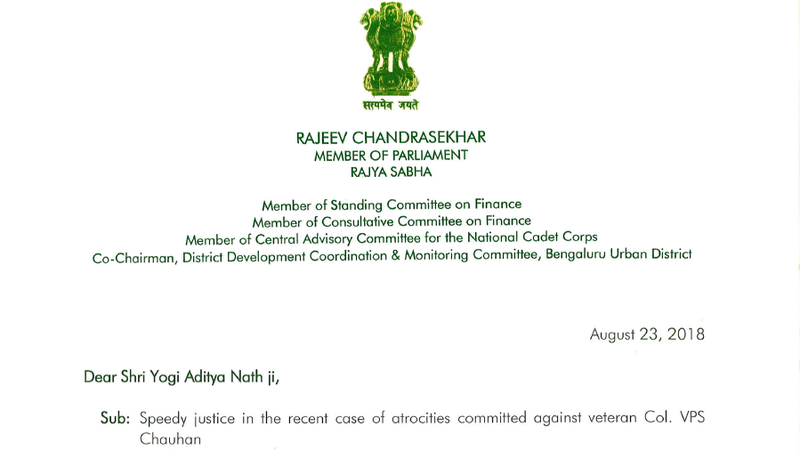 Saurabh Kalia and five jawans of the 4 Jat Regiment during the Kargil War in 1999. 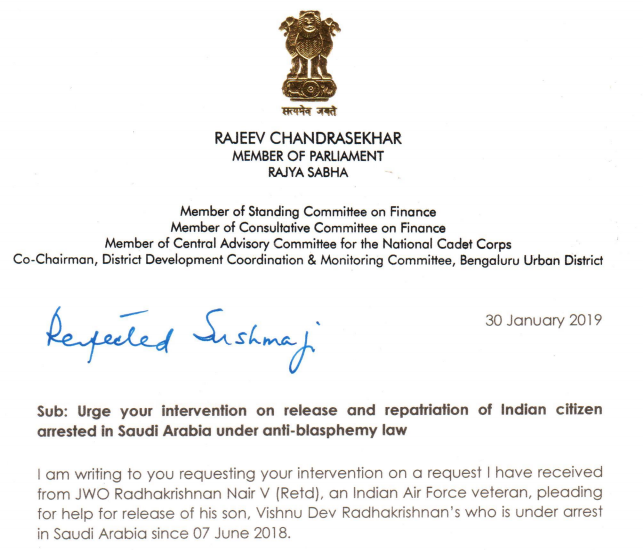 The petition was filed on 7 December 2012 with Mr Juan E Mendez, Special Rapporteur on Torture, Office of High Commissioner of Human Rights, UN Office Geneva. 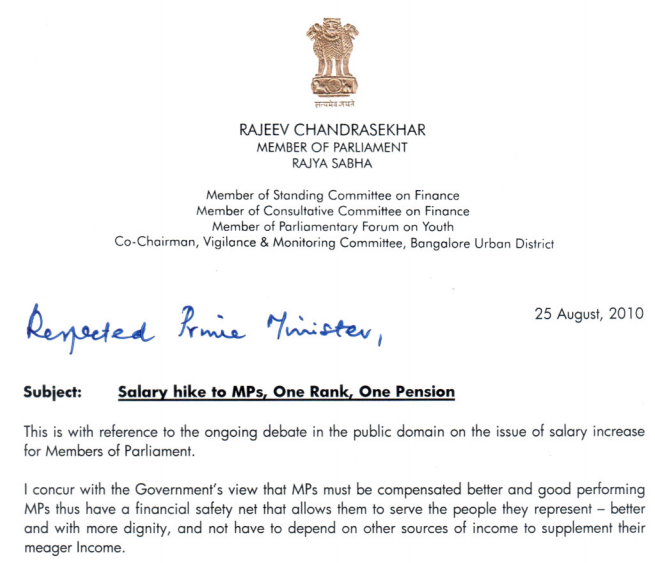 Rajeev continues to raise the matter in Parliament and in public domain. 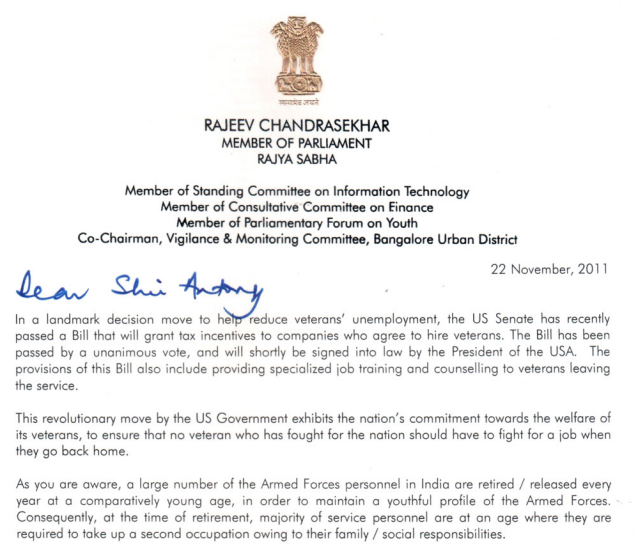 Rajeev is constantly engaged with veterans and their families and takes up matters for their welfare. 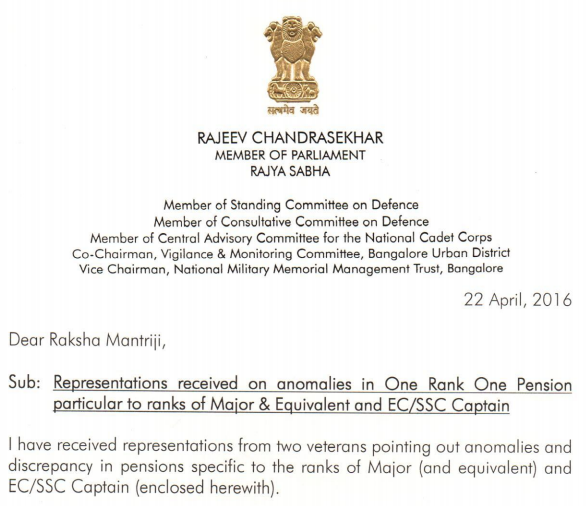 In a rare honour, in February 2016, he was felicitated by Lt Gen KJ Singh, then General Officer Commanding-in-Chief, Western Command, with the Army Commander’s Commendation Card for his contribution to the cause of the defence community and actively pursuing various defence issues, including welfare of the veterans, at the national level. 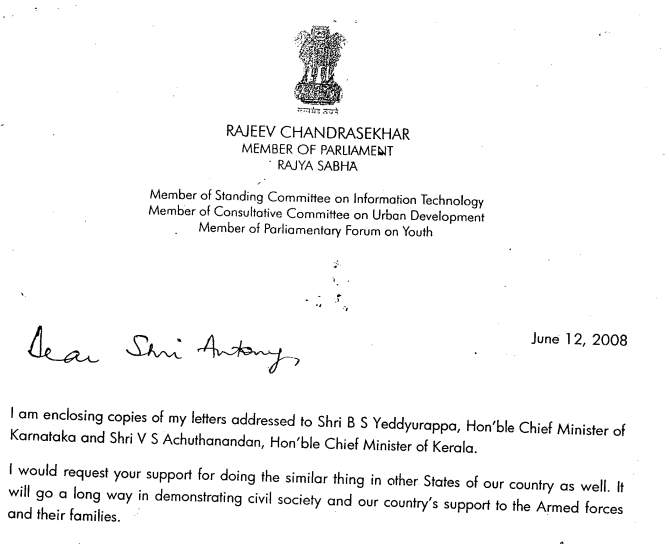 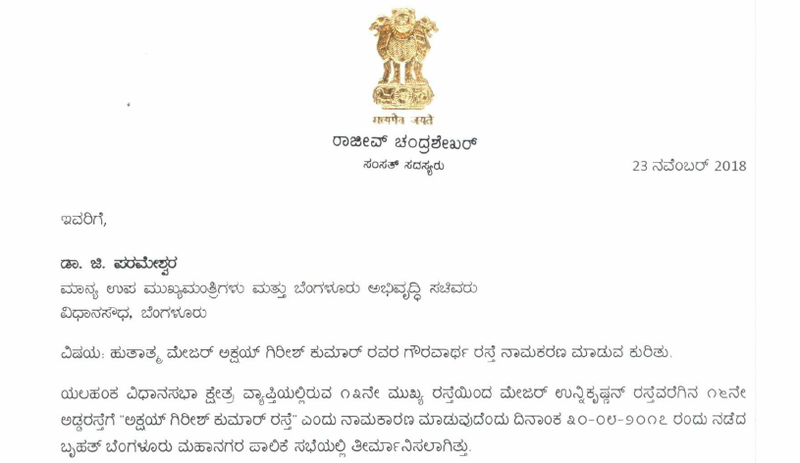 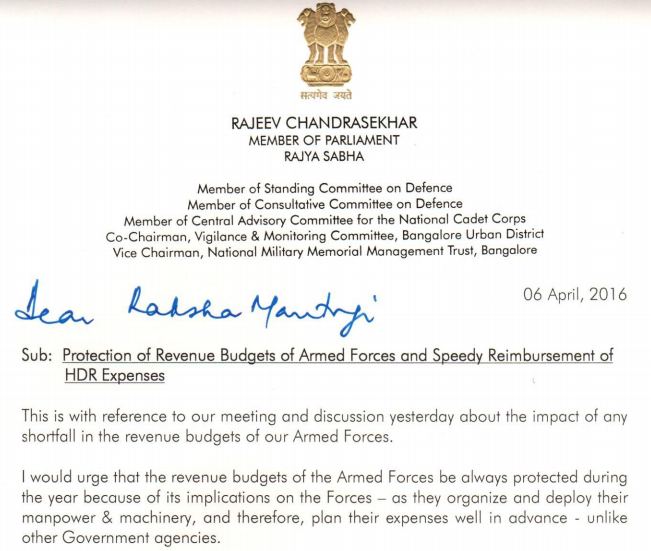 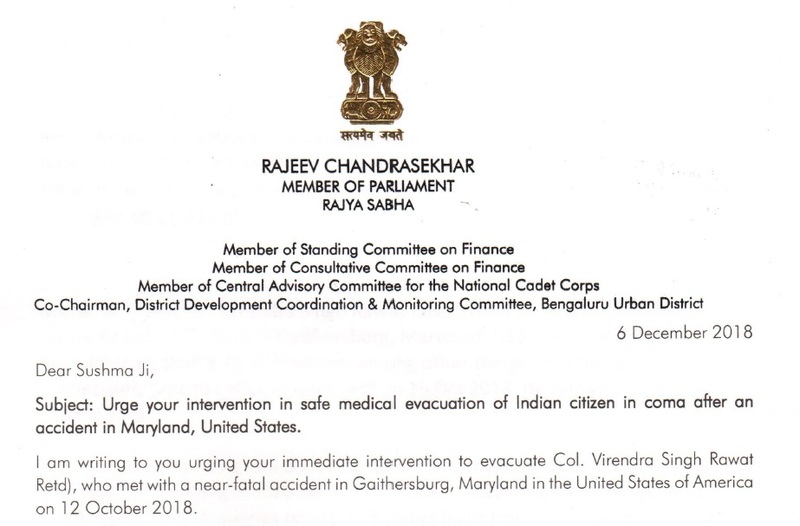 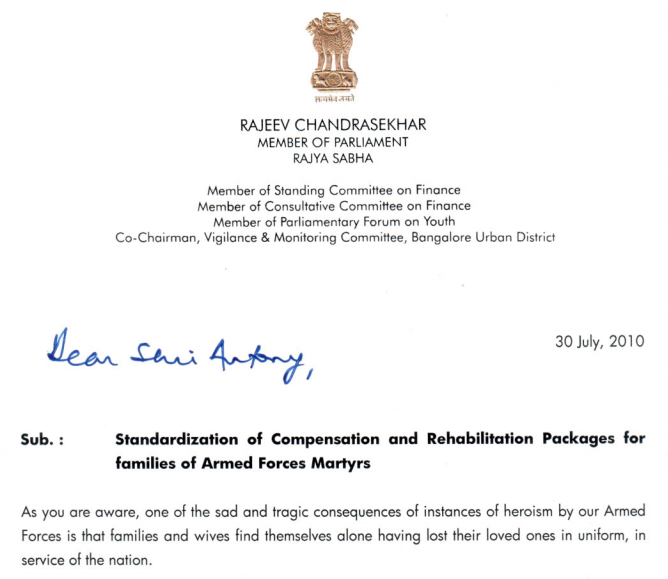 Rajeev writes to State CM's requesting them to take leadership on the issue of a Uniform Support Package for families of our bravehearts killed in action.